The Maiminsky district though the smallest in size, but the largest by a number of inhabitants of the the Altai region, it’s all due to the capital of the republic and its’ the only city, Gorno-Altaisk. It is interesting that until the 1932 year the capital was called funny for Russian ear name – Ulala, and up to 1948, the city was called Oirot Tour. Big, beautiful building of the museum, decorated with mosaics in the Scythian style inspires respect and esteem from the first look. The exposition is equally impressive and varies from typical regional museum exhibitions of minerals and stuffed animals to the mythical mummy “Ukok Princess”. It’s better to spend at least three hours for a walk through the museum to learn the history of the republic, have time to admire the paintings of Altai artists and explore the variety of national costumes. An item of acquaintance with the culture of Altai – visiting the hall dedicated to the Ukok Plateau. In 1993 a noisy scandal broke about a mummy of a young woman found by Novosibirsk archeologists on the Ukok Plateau. The reason is that the locals believe that the mummy belongs to the White Lady (Ak-Kadyny), which stands at the gates of the underworld, and prevents the penetration of evil forces in the world of people and therefore it can not be taken away from his native land. Archaeologists had a different opinion and took the mummy to the Novosibirsk Institute of Archaeology and Ethnography, where it was kept until 2012. All this time, there has been a serious struggle between the scientists and the people of the Altai, locals associated natural disasters that recently have happened (serious earthquakes, floods, and hails) because of the “Princess” being not in their native land. After all, scientists have compromised and gave the mummy to the Gorno-Altai Museum, where they built a special sarcophagus and room for her. But this was not the end of the story, to the present day Council of Elders of the Altai Republic demands to bury the mummy. So take the time to look at it until she is being returned to her native burial vault. The Spring on Communist Avenue. A rare city boasts a spring with excellent drinking water that gushes out of the main street. The natural fountain is located just a 5-10 minute walk from the intercity bus station. A viewpoint on top of the mountain Tugaya offers spectacular panoramic city views. Usually, people climb up the mountain on foot (in an average of 3 hours round-trip), but it also can be reached by car. This can be done from the Bayat street towards the TV tower. The road is not easy and requires a driver of extreme driving skills. There is a ski slope on the mountain, but it is not always working due to lack of snow recent years. The airport was built in 1968 and interconnected villages of Altai to Barnaul and to Novosibirsk for a long time only. Since the beginning of Perestroika until the 2011 year, it was closed for a total reconstruction and re-launched in November of 2011. In 2016 the airport’s new life began when it was bestowed the status of federal significance. Now the airport receives flights from Moscow, Novosibirsk, and Krasnoyarsk, and as promised by the head of the Republic, it will be given the status of international in few years. The Manzherok lake sung in the famous Russian children’s song, is a nature reserve and protected area since 1996. It is the only lake in the Republic where “horned” water chestnut “chilim” can be found. The resort is located at the foot of Little Sinyukha, a mountain overlooking the lake Manzherok. The resort is open all year round – in winter for skiers, in summer for tourists who want to ride on a ski elevator and admire the views from above. It is a small but very beautiful waterfall that many tourists like. But it is a little away from the road and its location do not give any pointers. In fact, you find it quite simple: you need to turn left in the middle of the village road, in front of the bridge over the river Cheremshanka (if you are coming from Biysk). Next you will find a fork in the road, turn right on it, and pass on foot the remaining half a mile to the waterfall . 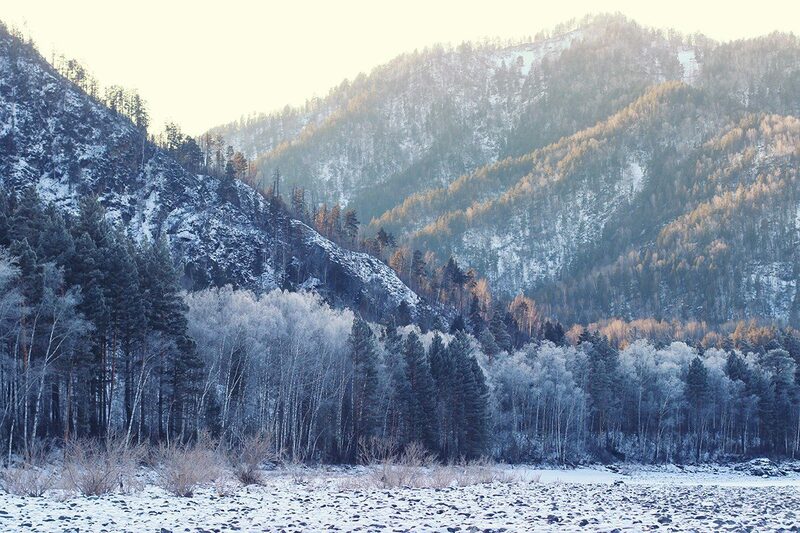 It is a place worthy of visiting, especially if you are the first time in Altai. The caves are located on the left bank of the Katun (you can get over the bridge in a car) near the village Izvestkovy. It’s not just one or two short caves, but the whole caves chain , which can be explored with interest. PreviousAltai trekking and hiking. Inegen – Tungur. NextChemalski district of the Altai Republic.